As the NBA Playoffs begin I reflect on the excitement of the regular season. Miami gets Lebron James, Shaq’s battle with father-time, The looming lock-out, the Sacramento Kings heading for Anaheim, the Lakers manic play, Kevin Love setting the NBA consecutive double-double record, the best dunk contest in a decade, Derrick Rose’s climb to the MVP, the ridiculous fine David Stern unjustly levied on Kobe Bryant, Blake Griffin’s High Fly better than Lebron’s Rookie-Non-Rookie season and oh yeah, the trade of Carmelo Anthony to the New York Knicks. Carmelo Anthony’s summer wedding to television personality La La Vazquez, is where Charlotte Hornet guard Chris Paul toasted that he and Anthony should get together in New York, for their version of a dream team, since then everyone knew that Carmelo Anthony would be traded. Why? Mostly because Anthony refused to sign a three-year 65 million dollar extension with the Denver Nuggets. Denver offered Anthony the extension only to over inflate Anthony’s value so they could dupe Mikhail Prokhorov the New Jersey Nets new Russian Billionaire owner into giving away the farm to get Carmelo. The trade talks swirled out of control with rumors that the Nets were sending as many as five first round draft picks as well as players to the Nuggets for Carmelo Anthony. The rumors stayed absurd until January when the Nets owner arrived in the states and showed the NBA exactly how he made his Billions. He shut down the season long trade negotiations, which shifted pressure on New York to get a deal for Anthony done. Every fan and sandbox sports prognosticator, analyst and commentator said “Get Carmelo Anthony at any cost”, “Talent like Carmelo Anthony don’t come by often”, “Get him now and sort out the details later.” They asked questions like “could Anthony and Stoudamire co-exist” , “would there be enough basketballs to go around” and “could Anthony handle the spotlight”. As the trade deadline loomed the deal for Anthony formed. Denver received Wilson Chandler, Raymond Felton, Danilo Gallinari, Timofey Mozgov, the Knicks 2014 first-round draft pick, the Warriors’ 2012 second-round pick, the Warriors’ 2013 second-round pick and $3 million in cash. 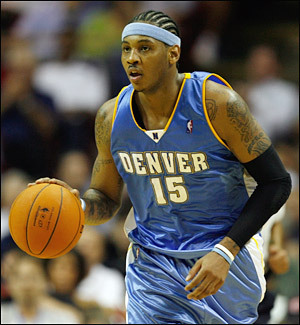 New York received Carmel Anthony, Chauncey Billups, Shelden Williams, Anthony Carter, Renaldo Balkman and Corey Brewer. New York wanted Chanuncy Billups included in the deal to make sure that ‘Melo’ was comfortable in his transition. The Nuggets received a host of young energy players with potential, New York waived Corey Brewer. Since the trade the Nuggets have played with good offense and passion, and the Knick have played with a lack of defense, motivation and chemistry. All of New York’s issues I am sure that columnist and commentators from around the nation will find a way to blame Isiah Thomas for. In the off-season Amare Stoudamire left the Phoenix Suns and signed a 100 million dollar contract with New York. He led a resurgence of a failed franchise. He had the commentators talking about the Knicks, but more importantly he had the fans believing. The Knicks were winning with Stoudamire leading the way. Amare wasn’t happy in Phoenix, always in Steve Nash’s shadow never getting the credit he deserved. He went to New York and was proving that his gripe was legitimate. Amare led the Knick to some stunning and amazing victories and he was the leading candidate for MVP, until the NBA trade deadline came near. The nearer the deadline, the more the newly resurgent Knicks began to falter. Never mind that trading away half of your team mid-season for a player who never defended is not a good idea. Never mind that the team could have waited and signed Anthony to a reasonable contract at season’s end, save for a lock-out. No. The pressure was get Carmelo now, Do the deal now and What are the Knicks waiting for. Was it the media’s pressure? Was it owner James Dolan’s myopic focus on Denver that he allowed the a deal for Utah’s star point guard Deron Williams slip through his fingers? New York could have had Carmelo Anthony and Deron Williams and still kept a player or two. In fact many in the media were surprised when Utah traded Deron Williams. Williams was abruptly traded to the New Jersey Nets and the Billionaire’s clinic was complete. Had any of these commentators actually seen Carmelo play? 22 million per year for Carmello when Lebron James and Dwyane Wade are earning 16 million per year. As a point guard Chauncy Billups is no slouch, but he isn’t two players either. Since the trade the New York has played a 14 -14 record and the Denver Nuggets have surged with a record of 18-6, Denver has also moved up two playoff positions, and it didn’t take a year to gel together like, Carmelo has said it may take in New York. The new Nugget players have played hard, fast and together. They run ten deep, share the ball and play defense. The real story of this blockbuster Carmelo Anthony trade isn’t the season long drama, it isn’t that the commentators were wrong or that New York win or lose may have to make a few more moves to get things right in the Big Apple. No the real tragedy here is how the Carmelo Anthony trade cost Amare Stoudamire this years MVP award. Now, Mr. Stoudamire wont suffer with his 100 million dollar contract, but if he never wins an MVP award he can look to the player standing next to him, to the owner and to the media. In the 2012 NBA season, even with the addition of Tyson Chandler, have been having a horrible season and have been outplayed by those cast out to get Carmelo, particularly Danilo Gallinari. The Knicks traded everything to get Carmelo, but yet they are still losing. “Expectations are still high. Things will still be great,” he said. “I’m not down, I’m not regretting anything. 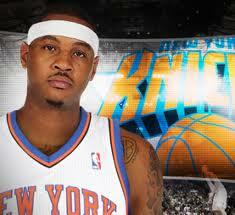 I’m not regretting the trade.” Carmelo Anthony. With Jeremy Lin playing like not other guard before will Carmelo seed the helm of the Knicks to him…I don’t think so. Big dogs don’t like little dogs even if it is to their benefit. There are many coaches in the NBA, some you may know and others you may not. There are a few outstanding candidates for this years Coach of the Year honors. In this article you can cast your vote for who you think the Coach of the Year should be. Here are the leading candidates for the prestigious award. 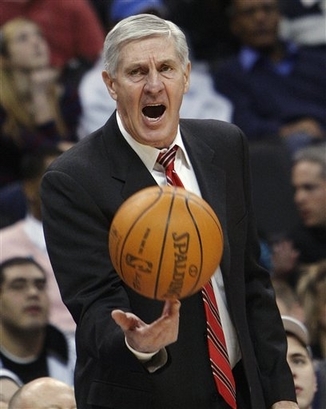 Jerry Sloan: The Jazz front man. He has coached for 25 years and has never won the award. His team shook off the dictracting trade rumors surrounding Carlos Boozer and are playing as the team to beat going into the playoffs. Scott Skiles: He has done a great job of coaching but an even better on of understanding and allowing his rookie Brandon Jennings develop, which has in turn allowed the once thought bust lottery pick Andrew Bogut (now injured) to finally start to shine. He has the Milwaukee Bucks in the playoff and looking dangerous. Scott Brooks: He has the young Oklahoma Thunder running and gunning. This team has taken on the top teams in the league and they have held their own without a big man in the middle. He has this team beliving. This is the team is where no one thought they would be, except for yours truly of course. Nate McMillian: The Portland Trailblaziers have made the playoffs after having the most injuries than any other coach candidate. With injuries to Centers, Guards and wingmen it would have been easy for this team to write off this season, but they haven’t quit yet. Stan Van Gundy: After a trade to add Vince Carter the Orlando Magic team make up is completely different from last year’s Easter Conference Championship squad, but amid the injuries and upheaval Stan has them threatening to repeat as champions.